The Great Ocean Road was the first ‘tourist trap’ that we’d encountered since spending the Easter break in Esperance region of Western Australia some five weeks earlier. Between locations was some 3000km of travel, mostly featuring barren, windswept desert and isolated plains. By day two of our journey along one of the great Australian tourist meccas, the initial novelty of packed tour buses filled with Asian tourists, natural ocean sculptures and crowded parking lots had worn off. We were ready for some solitude again. 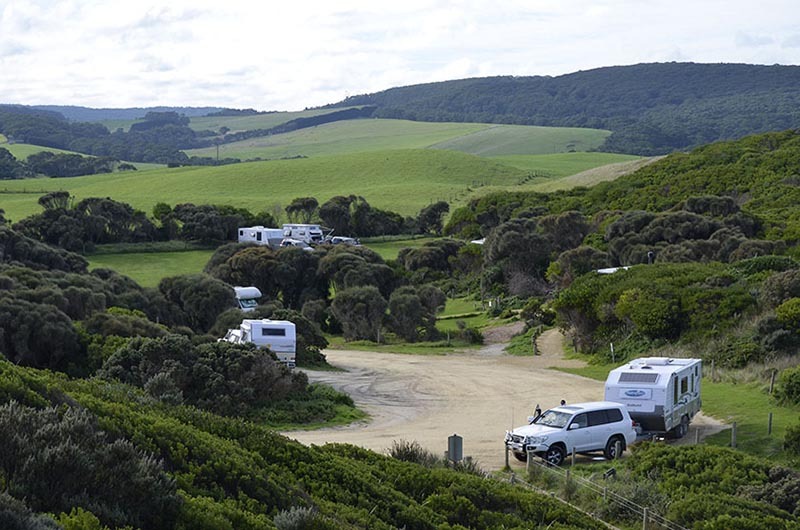 We scanned the digital map on our tablet PC and spotted a free camp along a secluded beach on the exposed side of the Otway Peninsula. This spot had positive reviews on the Wikicamps app we were using, and a few mentions of decent surf and fishing opportunities. 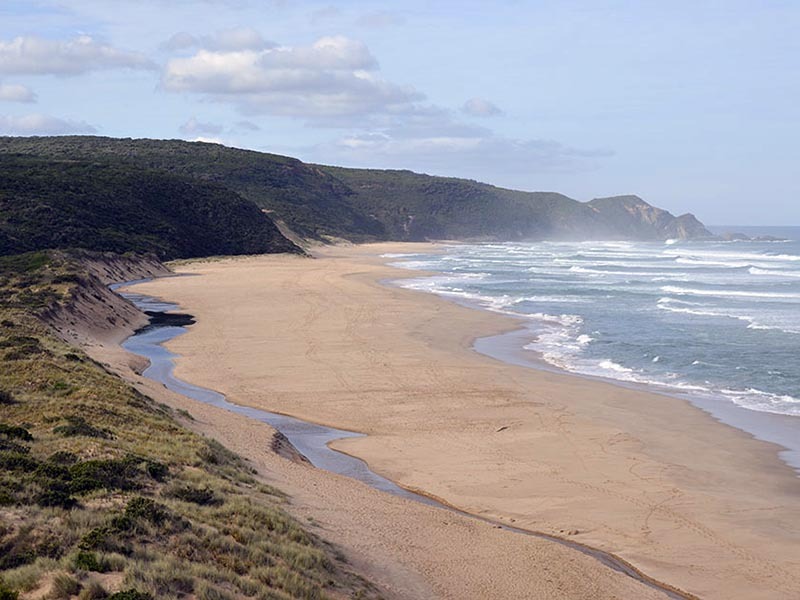 The promise of surf, fishing and relaxed coastal camping beckoned. After a light lunch and coffee we entered in the coordinates into our GPS unit and started following its mechanical sounding directions towards our destination. Usually the GPS is accurate and reliable, and over the past few weeks we’d developed a lot of trust and reliance on the device. However, it must have decided that we’d had it too easy and it was time to test our commitment to it. Over the next 45 minutes we drove down increasingly narrow roads, each turnoff taking us down a less used thoroughfare at a time. We passed two signs saying “NO THROUGH ROAD”. But it wasn’t the first time than we’d seen such signs even though the road did indeed connect onto another, so we cautiously disregarded it. Eventually we came to a gate. A sign on the gate simply said to remember to close after passing through, and there was a rough grassy track on the other side that went off into the distance. After a few minutes checking the GPS and our maps, it appeared that this was a service track that ran for a few kilometres and eventually connected to a road adjacent to our destination. Since we’d already spent almost an hour driving off the main road and didn’t want to backtrack, we made the decision to press on. Besides, we were driving a 4WD vehicle; it was time to make it worthwhile. Backcountry shortcuts are exactly what the Delica is designed for. 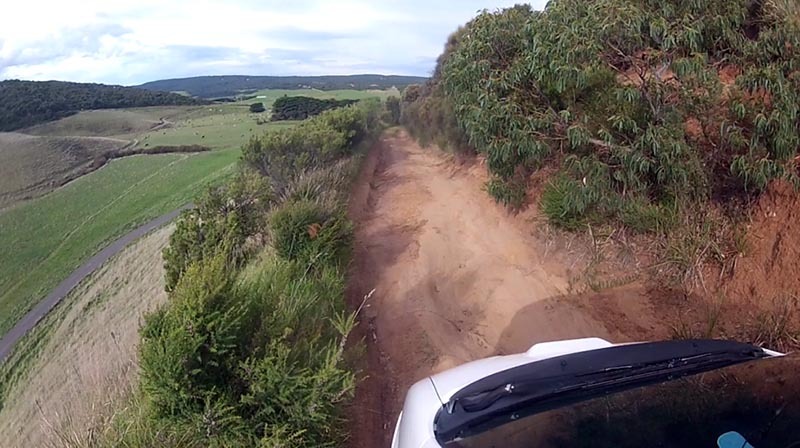 Just to be safe, I engaged the 4WD system once we had passed the gate. The track seemed reasonable enough, but the soil under the patches of grass was slippery and wet still after recent rain. We drove up the first grassy hill, and surveyed the other side. The one lane track weaved along one side of the grassy valley and we could see the beach and camp site ahead in the distance. Confident in the GPS and our maps, we continued on driving slowly along the washed out muddy ruts, avoiding large stones in the centre of the track that were often obscured by long grass. Although we had a front bashplate fitted to protect the oil sump and other delicate components, we still didn’t fancy dropping onto a stone and damaging anything else under the vehicle. As we drove further down the track, the condition deteriorated. There were large sections which were washed out and damaged; leaving tree roots and boulders exposed. Sections of the track were cut into the steep, grassy hillside. Considering how damaged and muddy the track was, and that we were driving a vehicle weighing over 2 tons, it was a challenging experience slowly crawling along the track. And good luck if we encountered another vehicle travelling the opposite direction! Thankfully, we didn’t. 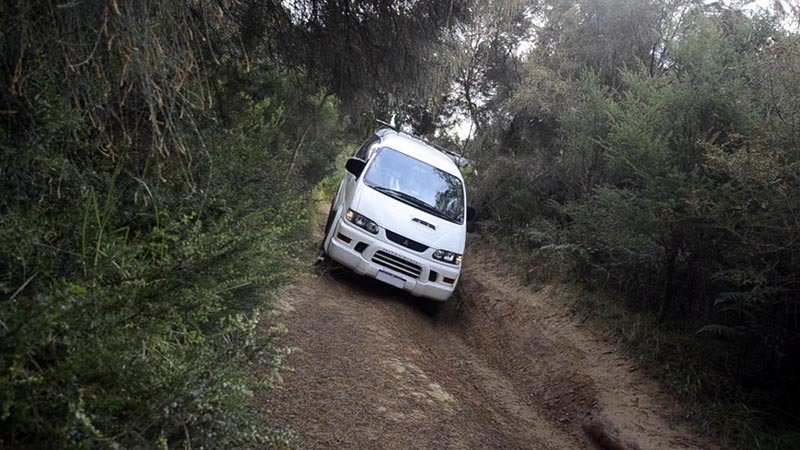 At one stage as we descended a washed out section, the Delica was driving on only three wheels. Although the service track was only 3km long, from the first gate to the beach, it took us almost an hour to complete. When we finally reached the last gate and could see the camp site, I stopped and checked under the Delica, half expecting to see some sort of vital fluids leaking out as we’d scraped across a few large stones despite our best efforts to avoid them. By what felt like a miracle at the time, everything was intact. The worst damage was a few scratch marks on the lowest section of the bash plate. When I originally bought the aftermarket bash plate the cost and weight of it seemed excessive, but now I realised how glad I was that I had it installed. Once we arrived at the campsite, we picked out a nice shady spot and got talking with the other campers. As luck would have it, the salmon had just stopped running two days before, and the sandbanks at the beach had been washed out recently. We didn’t catch any fish and only had one day of decent waves of the four we stayed. But was it worth it? Sure. 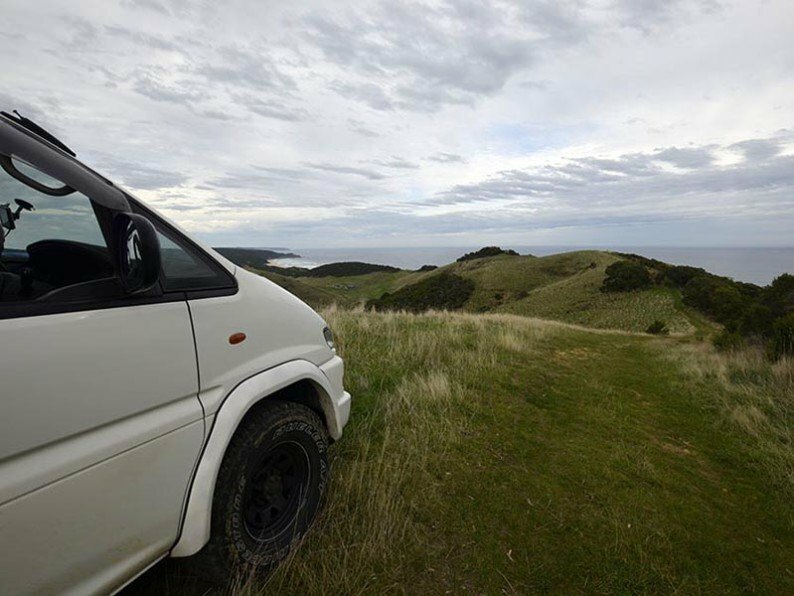 Adventure, excitement and getting off the beaten track is always worth it. Side note: Since the Victorian Government’s change to fees on State-owned / managed land in mid-2014, this site changed from being free to costing over $35 a night (per site) and requiring pre-booking. Times are changing. Wild, beautiful places are becoming more restricted, controlled and expensive to visit every day. Get out there and enjoy it while it lasts!